Life from the point of view of a bobblehead. These days, Arcade Fire has some big heads. Like, literally: When our most tender arena rockers returned in October with their new album Reflektor, they brought with them a matching set of giant, papier-mâché-esque bobbleheads — one for each band member — that have become a staple of their live show. We first saw them during the Here Comes the Night Time concert special, when it was Bono and Ben Stiller rocking ’em; we last saw them when Arcade Fire kicked off its Reflektor tour in Louisville by strutting down a red carpet in their own corresponding bobbleheads. 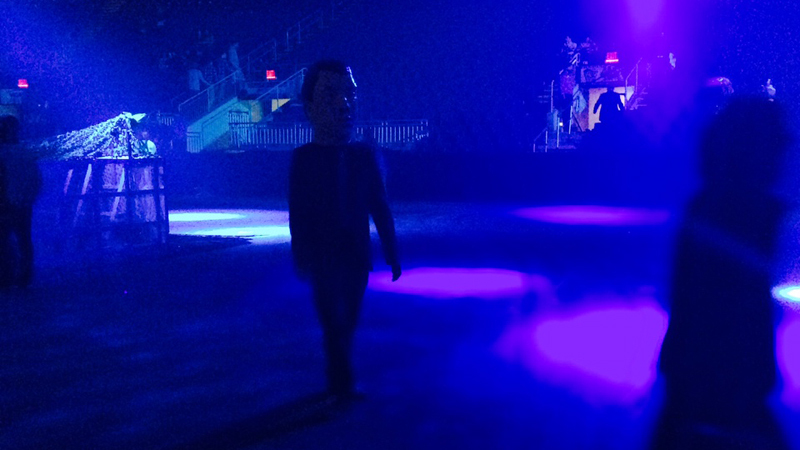 And on Tuesday night, when the band played Bridgeport, Connecticut, the bobbleheads resurfaced. I know, because I was one of them. The top secret missive came from deep within the Arcade Fire camp — we’re bobbleheading tonight. We need an extra bobblehead. Are you ready, willing, and able to assist in the case of bobbleheading? I say yes, mouth a silent prayer, and trek my way to the inner bowels of Bridgeport’s world-famous Webster Bank Arena. Once inside, things move quickly. The head (ahem) of the operation, a capable young woman named Julia, whisks off my coat and tosses me a blue suit jacket, embroidered with all manner of regal patchwork accoutrement. Then she gives me my head: For tonight, I am to embody the spirit of Mr. Will Butler. 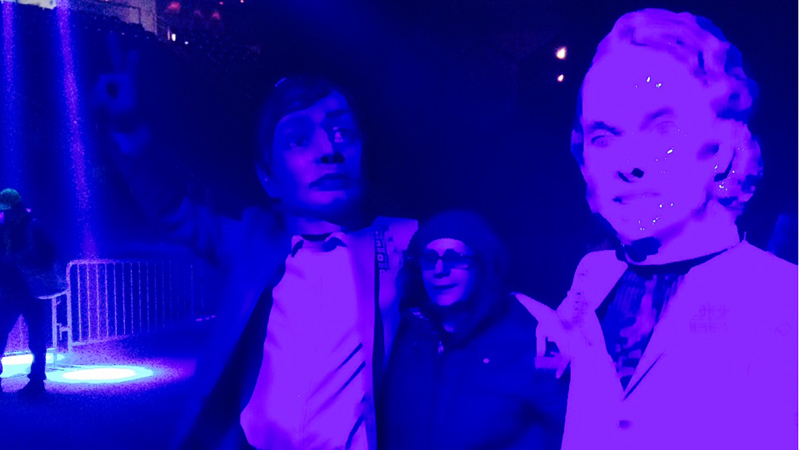 Around me are the rest of crew — bobblehead avatars of Win Butler, Régine Chassagne, Richard Reed Parry, and Tim Kingsbury — mysteriously already in costume. Who was inside those giant heads? Perhaps … Bridgeport’s native son Brian Dennehy? Possibly … UConn legend Rebecca Lobo? Could it be … Webster Bank CEO James C. Smith?!! But no time to speculate. Before I can even begin to get accustomed to my new head, I’m out on the floor in front of the stage. Our mission is simple: Entertain the masses with the grace of your dancing; say nothing. Then someone yells “Doors are open!” and the crowd starts to swarm. First thing’s first: I panic. It turns out this is like a giant, bulky blindfold-earplug combination — and one that I have to keep on, lest I shatter the suspension of disbelief. My only vantage point is through the nostrils, and so if I wanna see anything other than my own hands and feet, I have to tip the whole thing back. But I don’t wanna look like a total goon here, so I’m experimenting with a more artful tipback — a natural, “I wear bobbleheads all the time!” kind of move. And meanwhile, the curious revelers stream by us all. I twirl my arms, hoping my panic isn’t too apparent. And I try to talk myself down. It’s like Army training, right? I ask myself: If you were captured and interrogated — I guess by a rogue, terroristic performance art troupe? — could you survive this kind of hellacious, aesthetically pleasing sensory-deprivation chamber? Yes — yes I can. Deep breaths. Deep breaths. I calm down. I get adjusted. I accept temporary life through nostril-view. And then I face my next challenge: Everyone is keeping their distance! I see them staring, but not approaching. Is it my shoes? Is my belly button sticking out through my shirt? Or are these kids quite possibly — and quite rightly — terrified? Screw it. I take the fight to them. If they wanna claim prime front-row vantage points, they’re gonna have to get through me. I start slowly, grooving next to a few dramatically clothed concertgoers. (Arcade Fire asks people to dress up for these shows, and so anything from suspenders to Cinderella dresses to full-blown penguin costumes to the “I borrowed my older brother’s clothes and so I accidentally look like a baggy-suited mortician” look are in vogue.) I gain confidence, pulling out the classic “break up a friend huddle via dance” move. I realize some of these Arcade Fire fans are really young, and so as to avoid even the appearance of impropriety I consciously stay away from the girls — and then I realize trying to steal their boyfriends away through the seductive powers of my dancing is not really a good look either. I get animated! I do a lot of dance-punches! And then I remember I have no idea how close anyone is to me, and so I stop before I actually connect a right hook into someone’s face and get arrested for assault-by-bobblehead. I revert back to just kind of waving my hands around people, as if I’m wanding them for explosives at the airport. I have low moments, to be sure. At one point my notes fall out of my back pocket, some good soul hands them back to me, and I say “thank you” in my own voice — terribly breaking character. Also, the floor has been marked with the creepy Reflektor album cover graffiti, and seeing it now, like this, in impeded vision, as I stumble around in near darkness, gives it an extra oomph of ritualistic-murder-cult significance. Let’s just say it doesn’t feel out of place for one of Rust Cohle’s found home videos. But I begin to accept my larger-than-life bobblehead character, and act accordingly. I nostril-spot one dude in dumb neon headgear and pretend to steal his beer. He reacts with a deserving “No way bro!” Another kindlier bro then offers me one of his cold ones. Seeing as I would have to drink it through my bobble-nostrils, I have to politely decline. And eventually, the fans warm up, and even get close enough to take pictures with me. Of course, I happily pose, throwing up all manner of peace signs and very appropriate thumbs-up. I am giving them memories to last a lifetime. What a joy they must be experiencing. Also: One lady has her phone out to snap a pic and I grab it, then ineffectually jab my finger into it a bunch before handing it back — classic bobblehead-selfie psych-out! Finally, I am relieved of duty. Sweaty, pushed to the very edges of my dancing extremes, I’m led by our friend Julia (now in her own fetching skeleton face mask–and–black shawl ensemble) into the DJ area. It’s ringed with a green military netting, giving it a quasi-medic-triage-MASH-vibe. And as I remove my bobblehead to take a giant gulp of sweet fresh air, I think this feels only appropriate. Toward the end of the night, after the encore, the bobbleheads and I are asked to reconvene. Throughout the tour, usually at this juncture, Arcade Fire has been dropping regionally appropriate covers (Prince in Minneapolis, Boyz II Men in Philly). But Connecticut being somewhat of a cultural wasteland, the band uses this opportunity instead to fire a shot at its frenemy John Mayer (born right here in Bridgeport!). Win’s voice, piped in from offstage, explains that, with limited options, the band is forced to take on Mayer’s “Your Body Is a Wonderland.” And so, with us bobbleheads as stand-ins dancing around on the side stage, the dastardly “Wonderland” is piped in. Wait — No! No! This is all wrong. Win and the real band pop back up on the real stage, shoo us off, and kick in to the real encore instead. Before I headed out to that side stage, Julia had handed me a guitar. I was all set to get up there and fake shred, but as I climbed the stairs, I realized the neck of the thing has gotten caught in that military netting. I pulled at it furiously, and my fellow bobbleheads even tried to help. But it just wasn’t coming loose. “What should I do?” I yelled. “Should I abandon the guitar? !” “Abandon the guitar!” Julia instructed firmly, and so I trotted out there, guitarless, but in time for the jam to drop — just barely avoiding calamity. But hey, man. That’s bobblehead rock ‘n’ roll.